Trigana Air Service flight 257, an ATR 42-300, was destroyed when it impacted a mountainside near Oksibil Airport in Papua, Indonesia. All 49 passengers and five crew members sustained fatal injuries. The ATR-42 departed Jayapura at 14:22 LT (05:22 UTC) and was expected to arrive at Oksibil at 15:04 LT (06:04 UTC). At 14:55 the pilot made first contact with Oksibil Aerodrome Flight Information Services (AFIS), reporting cruising at 11500 feet over position Ambisibil. The AFIS controller acknowledged the message and instructed the pilot to report when overhead the airport. The pilot reported that they intended to fly a direct left base leg for runway 11. The Oksibil AFIS officer then told the pilot to continue approach and to call when position on final for runway 11. There was no further contact with the flight. The aircraft wreckage was found the next day on a ridge of Tanggo Mountain at approximately 8,300 feet AMSL, about 17 km from the airport. The investigators concluded that the flight crew deviated from the standard approach procedure over mountainous terrain. There was no EGPWS warning nor any other EGPWS callout during the descent. The Oksibil Airport was not provided with the high-resolution terrain data in the database version installed on the accident aircraft's EGPWS. Additionaly, some pilots within the air operator had experiences that the EGPWS warning became active in a condition that according to the pilots, the warning is not appropriate. These experiences led to the pilot behaviour of pulling the EGPWS circuit breaker to eliminate nuisance of EGPWS warning that considered unnecessary. The investigators could not determine the actual EGPWS CB position during the accident flight. 1. The deviation from the visual approach guidance in visual flight rules without considering the weather and terrain condition, with no or limited visual reference to the terrain resulted in the aircraft flew to terrain. 2. The absence of EGPWS warning to alert the crew of the immediate hazardous situation led to the crew did not aware of the situation. There was no information related to the status of ZX NDB published on NOTAM prior to the accident. KNKT recommends to ensure the status of the navigation aids disseminates to the air navigation user in timely manner. The flight plan form was filed with intended to fly under instrument flight rule (IFR), at flight level 155, with route from Sentani to MELAM via airways W66 then to Oksibil. The MORA of W66 between Sentani to Oksibil was 18,500 feet. 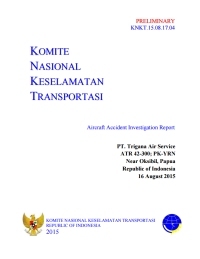 KNKT recommends to ensure filing the flight plan and flight execution is accordance with the regulation. The investigation could not find any regulation required for training of any addition or system modification which affect to the aircraft operation. KNKT recommends to develop regulation requirement for training of any additional or modification to equipment that affected to safety of aircraft operations. The information for Oksibil published in AIP volume IV (Aerodrome for Light Aircraft/ALA) did not include approach guidance. The operator issued visual guidance of circling approach runway 11 for internal use. KNKT recommends to publish the visual route guidance for airport without instrument approach procedure. PBN offers a number of advantages over the sensor-specific method of developing airspace and obstacle clearance criteria. KNKT recommends to consider the application of Performance Based Navigation (PBN) approach for compatible aircraft to fly in area with ground-based navigation system implementation is limited. There was no information related to the status of ZX NDB published on NOTAM prior to the accident. KNKT recommends to ensure aeronautical information for air navigation is updated in accordance with the current condition, including the serviceability of the navigation aids. EGPWS has worldwide terrain coverage in low resolution terrain data including several airports with significant traffic movements. The Oksibil Airport was not provided with the high-resolution terrain data in this database version. KNKT recommends to coordinate with the manufacturer to provide several airports in Indonesia with EGPWS high resolution terrain database. To emphasis the flight crew to comply with the company procedures such as crew briefing, checklist reading, approach procedure and visual flight rules (VFR) minima and provide monitoring system. To ensure the maintenance data record up date includes the installed component. 13 December 1990 N421TE Trans States Airlines Incident: Blew 2 tyres after swerving on landing Madison, WI. Cause: Steering differential valve defective. 16 Jun 1997 N421TE Trans States Airlines Incident: Evacuated following left engine fire warning during taxi At St. Louis, MO. Warning was false. Cause: Bleedair duct leak. 8 August 1999 N421TE Trans States Airlines Incident: Diverted to Springfield, IL after left engine was shut down due to "low oil pressure" warning. 23 July 2000 N421TE Trans States Airlines Incident: Emergency landing due to flight control difficulty while in cruise flight. Cause: Failure of aileron trim switch due to foreign material contamination. 5 February 2003 N421TE Trans States Airlines Incident: Emergency diversion to Bloomington, IL after crew saw and smelled smoke. 23 February 2003 N421TE Trans States Airlines Incident: Nose gear axle broke; right wheel separated during taxi at St. Louis, MO. Distance from Jayapura-Sentani Airport to Oksibil Airport as the crow flies is 258 km (161 miles).